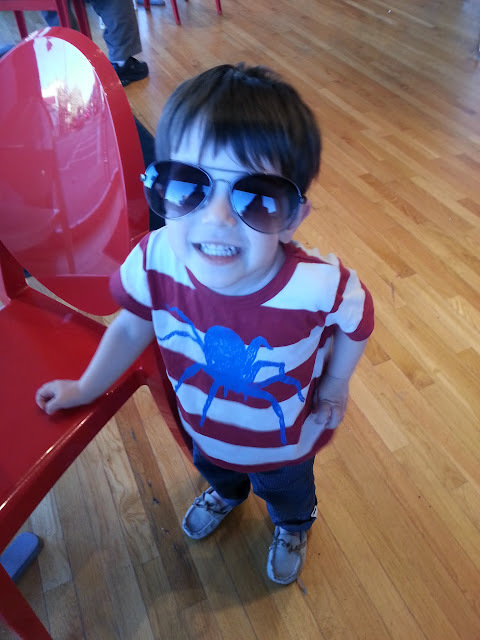 This is me in my spider shirt. Yes, I was wearing it two days ago, and you should prepare yourself to see me in it a lot more since I've officially declared it my "favorite shirt!" Mommy and Daddy already had to spot clean it a couple of times because it didn't have time to go through the wash before I demanded to wear it again. This is the first time I've ever cared what I am wearing, but who can resist an awesome shirt with a giant spider on it!? Daddy, aka THE CLOSER, is upstairs putting Enzo to bed. He says, "Okay, time to brush your teeth" to which Enzo replies, "nah nah naah nah naaah, I over here." Today, I discovered a "giant sandbox" near the playground! 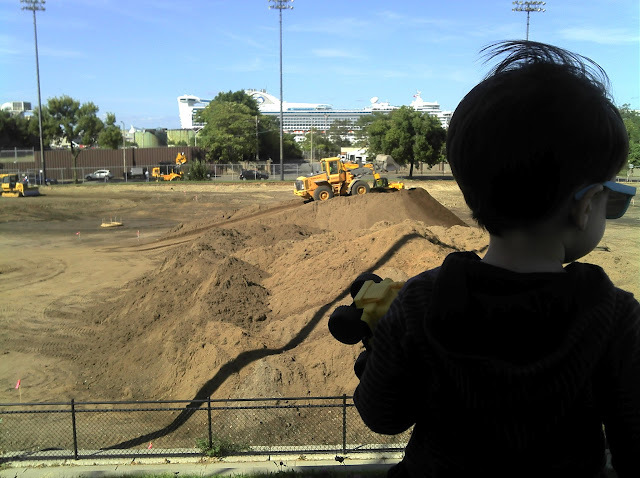 There were all of my favorite construction vehicles moving tons of dirt around. I told mommy they were "look'n for gold!" and asked "where all the boys were going" after they carefully parked their machines promptly at 3:00 PM. After they left, I went back to the regular sandbox and reenacted everything I saw the "boys" do. Mommy wanted to mention one other unrelated incident. Later, some big boys (6 or 7 year olds) came to the playground and were playing chase and I randomly chose one boy to chase while saying "Hey, get back here Vigo! Follow me Vigo! Let's go over here Vigo!!" Mommy was pretty sure his name wasn't Vigo, so she asked me if I had asked his name and the boy said, "No! He didn't ask my name, he's just been calling me Vigo, but my name is William!" Mommy found this hilarious, but tried not to laugh while explaining to me his real name. I acted like I understood, but later when we were walking back to the car I asked, "Hey, where'd Vigo go?" Mommy just started cracking up. 5:00 - mommy hears tiny footsteps but doesn't have her glasses nearby, so she asks daddy to peak; daddy says he sees nothing. So, Enzo has been diaper free during the day (including naps) for 4 weeks as of today! He's been peeing like a champ both at home and out and about. Number 2 has been another story, but we had a breakthrough today and he went by himself 4 times! He was holding it for several days at a time, but we showed him a video of himself going another day and that really helped. His pull ups are always dry in the morning. We'll probably have some accidents ahead of us, but I think it's safe to say we're done with diapers! mommy and daddy are in the kitchen working on a recipe. enzo is playing with his construction toys in the living room in his pjs. daddy looks in the living room and sees enzo trying to remove the tray in his potty and goes to investigate. it's full of pee and enzo's pants are on and dry! he's gone to the potty himself. put his pants down and up and was about to clean up after himself! hopefully, this is a good sign! The other day I tripped and fell running around in the kitchen with my buddy Zak. Daddy didn't think too much of it because I was acting fine two minutes after, but the next day he and mommy noticed I was limping. They gave it a day and the next day I was still limping, so I had to go and get it checked out. The doctor said he thought I was fine, but kids have been known to have broken bones with no other symptoms but a limp, so he sent me for some x-rays just to be sure. I surprised mommy with how good I was. I held perfectly still on a big table while the machine took pictures of my knee - three times! The doctor said everything looked perfect, so mommy was very happy. I milked it as much as possible and got all of my favorite things after we left the doctor's office. A bagel from Au Bon Pain, a chocolate milk from Starbucks, and a gummy worm, gummy frog and some gummy bears from the candy stand. Mommy would like to make it at least a month or two without another trip to the doctors with me, but we have a couple follow ups from my surgery on July 10th. Hopefully, those will be the last for a while! Knock on wood!! And in other news - keep going to page 2. I am finally well enough for mommy to update the blog and not worry about me, so she's been busy and there is a whole second page of new posts to see! "that's good! I like boogers! mmmm...."